Arturia MicroBrute Review - Genetically gifted! QuentinP13's review (This content has been automatically translated from French)" Few things namely"
Received it a few days ago I am writing this review to answer questions that may arise and some whose answers would have saved me 300 euros. - The USB OUT which acts MIDI out (a belief that it is cheaper to make usb as noon) does not support the data sequencer! To summarize the USB OUT does not allow you to be able to control a DAW only with the keyboard, one wonders what use has a master keyboard 10x20 cm. I find it absurd, incoherent and useless. And especially dishonest pars Arturia not specified in the features! 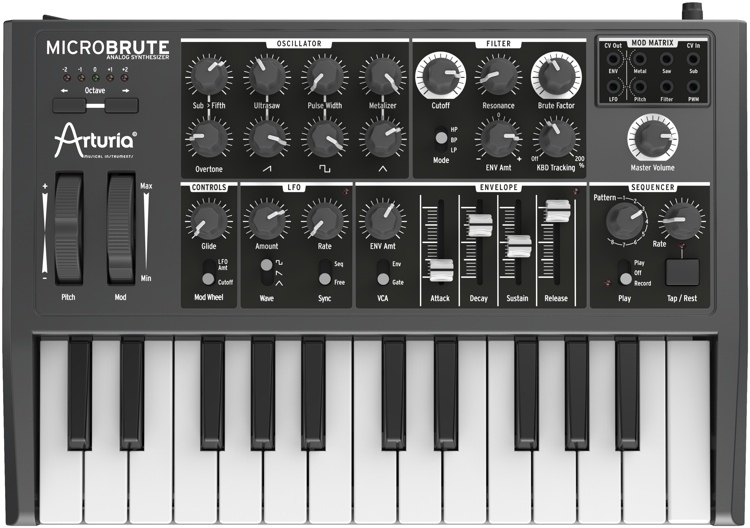 people are going to buy a Microbrute to use master keyboard, ditto for Minibrute are big brother, the output this time "MIDI" does not allow the output of the arpeggiator. Save as much as to the end and not put out, those who uses a digital output to one of the two raise their hands. NEVERTHELESS: Despite cachoteries Arturia, I could see the Microbrute, and I do not even know if I'll eventually sell because it is really a very good price / quality ratio, very nice finish, manual in french and even with detailed explanations of the basics of synthesis. And its really good, I think for that price, I'll keep it because it is really not far from SH-101 to 400 euros less and his whole life ahead of him. This small French synth deserved a 9/10 it will come out with a 7 for the inconsistency of policy communication with other devices. jonathan44's review (This content has been automatically translated from French)" a world of gross!!" af see it make its better than me! no special configuration, small software is lit, the heater, the knobs on the rule base patch (the basic manual explains ds) and c party!! has arturia download on the site for some zm settings, noon channel, mode sequencers, etc. .. the manual is well done but a little light for my taste, what I like c is the court that it contains for conprendre which button does what son.tres nice for a beginner in analog synth as moi.l interface is clear and simple. what I like c is the sound alive and généreux.on can go from a simple organ sound of a fat and well violent.je her think that he can adapt to all kind s of son.les effects are just terrible and matrix form a big ball and I speak not of the same overtone or more gross factor.un not have negligible platelets to position comes with its microbrute and have presets, it Yen same blank for your own settings. I recommend to buy mini jack nestable for matrix mode, it increases opportunities for he book two simple non-nestable damage especially that it makes it clear that each output can go ds each entry 2out and 6in.en big to one single could connect 12 mini jacks nestable but I guarantee not résultat.je keeps the best for last, the sequencer mode, which saves 8 sentences différentes.le adjustment is via the small usb soft (not supplied) eg on I have put mine loop mode for the sentences to be played repeatedly. 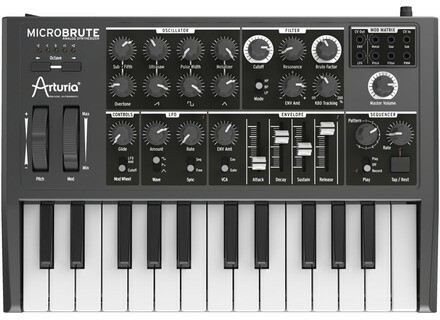 for me who knows nothing analog synth, I think we microbrute is intended for 299 euros is not risk chose.un good buy to start and become familiar with this type of machine.c is simple I is not could try it n SINCE equivalent exists pas.franchement the value for money is just perfect, it's still plastic except the bottom but its exudes quality, without knob games except envelopes but normal since mounted faders (c light) I chipote.encore a good 2 knobs that fit inside al, never to touch (back al synth) negative point between two settings on some buttons to level large lfo.en there is a setting on some button, c is either upwards or downwards, well you can put in the middle (not expret course), running the button too long and suddenly the button does not work (I still quibble.) if I had the choice again I do without problem, Has she not the MiniBrute will soon join his little brother and his cousin spark.nous live in a world of gross, so expect that!!!! Analog synth keyboard two octaves minitouches. No memory but small sequencer. Simple setup if you know edit a subtractive synthesizer. At the same time, a lot of possibilities for a single oscillator. Little advice hot, I just bought this little synthesizer, I was amazed by the sound, opportunities, and printing quality / strength for a synthesizer 299 euros is just staggering! That said they are distant cousins ​​of the aggressiveness of their filter .. I'll compéter my opinion, but I wanted to post right away because I was amazed, it will in the medium term. My only regret is that the CV out jacks that could be used for midi / cv interface, and I would have preferred a rather arpeggiator, a sequencer, you will have to use.